And only one blister to show for it. Not bad. Gorgeous! 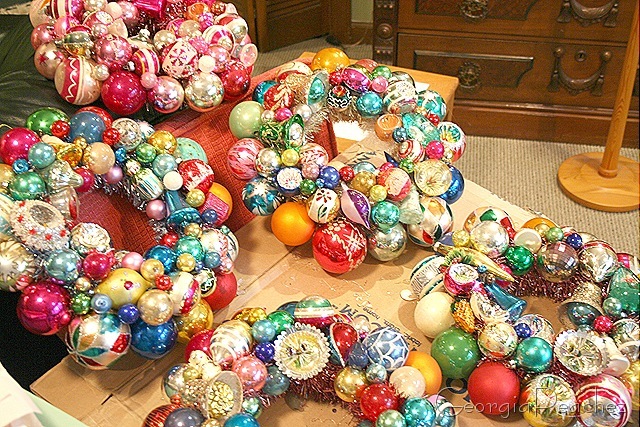 I wish I could find some old ornaments to make some of those. You work fast! Each and every one of them is outstanding, not to mention gorgeously festive. When will you be listing them? Love the pink one especially! Beautiful! I am looking forward to when they are listed for sale! Wow! When you set your mind to something…you just go. They look amazing! Suzy, they’re so vintage-y gorgeous! Wiping the drool off my computer keyboard right now!! AWESOME!! Beautiful! Prettier than on the tree I think. Wow!!! I love it!!! I am sure, it would be very perfect if I decorate that in my room. LOL!!! I feel like I must have been living under a rock because I just discovered your blog today! I love your sense of style and color. Your Christmas wreaths are stunning. Now I’m going to sip my coffee and peruse the rest of your delightful blog! absolutely beautiful, are there any more for sale?